Galaxolide is a synthetic musk, a commonly used fragrance ingredient found in household products. Galaxolide is widely used by cleaning and personal care product companies and can be found in many products including surface cleaners, laundry products, air fresheners, cosmetics and perfumes. The use of Galaxolide has been steadily increasing in the United States over the last 30 years. Women’s Voices for the Earth commissioned a GreenScreen® for Safer Chemicals assessment of Galaxolide to determine its hazard level. GreenScreen® for Safer Chemicals is an internationally recognized tool for comparing and assessing the hazards of chemicals in order to identify those of high concern and evaluate safer alternatives. A GreenScreen® takes into account data on 18 different health and environmental endpoints to determine a hazard score. The GreenScreen® assigned Galaxolide a score of Benchmark 1. Benchmark 1 is assigned to chemicals of highest concern whose use is recommended to be avoided. Specifically, the GreenScreen® assigned the Benchmark 1 score due to Galaxolide’s high persistent, bioaccumulative and aquatic toxicity properties. This means that Galaxolide does not break down easily in the environment, builds up over time, and is highly toxic to fish and other aquatic creatures. A number of studies have detected Galaxolide contamination in the Great Lakes, in the water, air and sediment. When household products containing Galaxolide are used, the long-lasting fragrance chemical ends up in wastewater, which survives wastewater treatment plants to end up in our waterways and eventually in the Great Lakes. One study found Galaxolide in 81% of water samples from Great Lakes tributaries that run through urban areas. A study on Lake Michigan detected Galaxolide in 92% of water samples, and even detected airborne concentrations of the chemical in the air above the lake. Another study on Lake Erie and Lake Ontario found that accumulating levels of Galaxolide in the lake sediment are doubling every eight to sixteen years. The GreenScreen® also noted a moderate human health hazard for endocrine disruption. 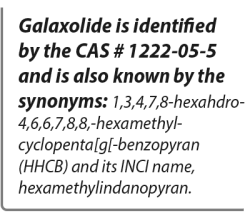 This means that Galaxolide may interfere with hormones and other chemical signals in the body which can result in developmental, reproductive, metabolic, brain, and behavior problems. Emerging science also indicates that Galaxolide may break down the body’s natural defenses against other toxic chemical exposure. This new science is concerning as several studies have shown that Galaxolide exposure is ubiquitous in humans. One study detected Galaxolide in the blood plasma of 91% of the study participants. Those participants that used scented lotions and perfumes had significantly higher levels of Galaxolide than those that did not. A study of new mothers found Galaxolide present in 97% of breast milk samples. As a persistent and bioaccumulative toxic chemical, Galaxolide pollution will simply get worse over time as we continue to use it. Levels of Galaxolide in Great Lakes water, sediment and fish will continue to rise due to accumulating contamination from wastewater that enters the lakes. The trend towards increasing Galaxolide contamination in the Great Lakes can be reversed. For example, the use of Galaxolide by European product manufacturers has been on the decline for years. Several U.S. manufacturers making scented products have also already phased out the use of this chemical in their products. Manufacturers still using Galaxolide simply must follow this lead. DOWNLOAD and view the complete GreenScreen® assessment of Galaxolide. US Environmental Protection Agency (2014) TSCA Work Plan Chemical Risk Assessment, HHCB, 1,3,4,6,7,8-Hexahydro-4,6,6,7,8,8-hexamethylcyclopenta-g-2-benzopyran CASRN: 1222-05-5. EPA Document# 746-R1-4001. August 2014. Baldwin AK, Corsi SR, DeCicco LA, Lenaker PL, Lutz MA, Sullivan DJ and Richards KD. (2016) Organic contaminants in Great Lakes tributaries: Prevalence and potential aquatic toxicity. Science of the Total Environment. 554-555, 42-52. 2016. Peck AM and Hornbuckle KC. (2004) Synthetic Musk Fragrances in Lake Michigan. Environmental Science and Technology. Vol. 38, No.2, pp. 367-372. 2004. Peck AM, Linebaugh EK, Hornbuckle KC. (2006) Synthetic musk fragrances in Lake Erie and Lake Ontario sediment cores. Environmental Science and Technology. Vol.40, No. 18, pp:5629-35. September 15 2006. Luckenbach, T. et.al. (2005) Nitromusk and polycyclic musk compounds as long-term inhibitors of cellular xenobiotic defense systems mediated by multidrug transporters. Environmental Health Perspectives. Vol 113. Number 1. January 2005. Hutter H. et.al. (2009) Synthetic musks in blood of healthy young adults: Relationship to cosmetics use. Science of the Total Environment. Vol. 47, pp: 4821-4825. 2009. Reiner JL, Wong CM, Arcaro KF and Kannan K. (2007) Synthetic Musk Fragrances in Human Milk from the United States. Environmental Science and Technology. Vol. 41, No. 11, pp: 3815-3820. 2007.